I have been away for the past few weeks making new work. I had a wonderful time walking in driving winds and torrential rain, the typical English walking experience for this time of year. 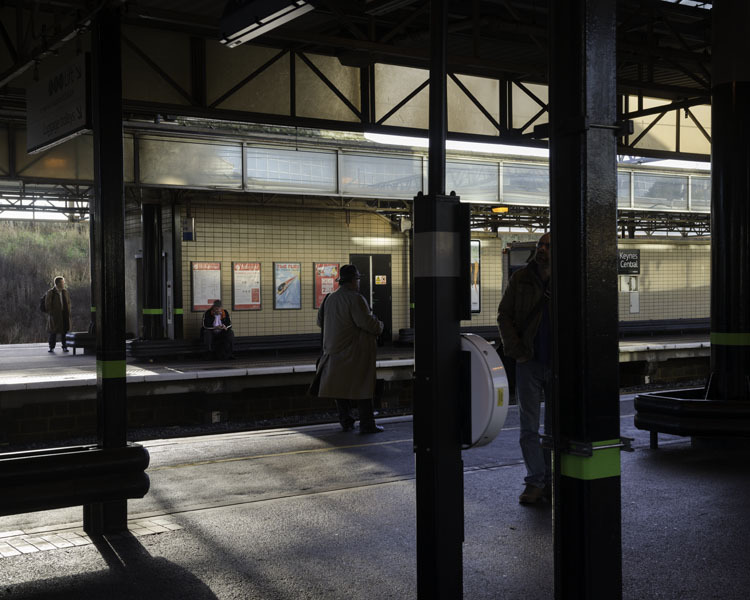 I made this photograph at the end of a day’s walk whilst waiting for a train in Milton Keynes. Recently, I came across a wonderful little publication called 2ha. 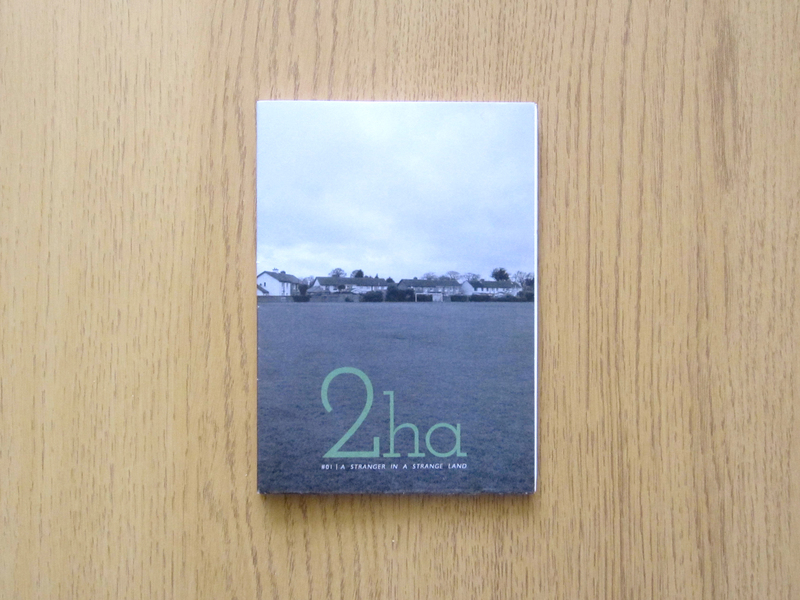 Edited by Michael Hayes, 2ha is an independent magazine interested in the overlooked aspects of the Irish suburbs. Each of the themed issues, published every two months, look at the exploration of the suburbs in a different way such as mapping, photography and public space. Featured here is issue one, #01 A Stranger in a Strange Land. 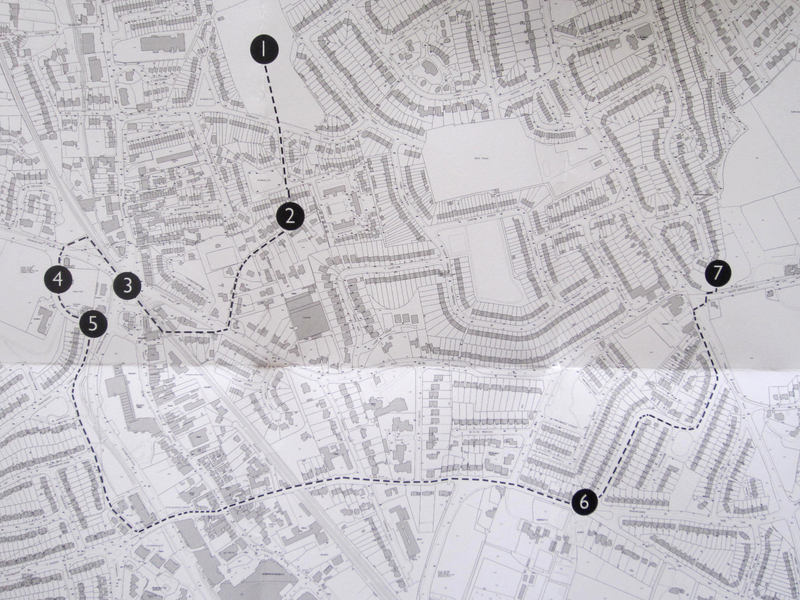 It explores the potential of mapping and understanding our suburban environment. of what we already know or what we assume to know. A fresh perspective is sometimes necessary. There is a value in making the familiar somewhat unfamiliar. For this exercise, we recommend walking. The publication comes as a beautifully printed, fold out piece. On one side, there is information about the project, as well as a map. The map is a suggested walking route around the Dundrum/Goatstown area of dublin. On the other side are detailed descriptions of each of the stopping points, using text, photography and graphics. By using the map and walking the suggested itinerary, we are guided past everyday places such as a local football pitch, a library and some allotments. All of these vernacular locations are further explained on the map, drawing our attention to places we may ordinarily pass by without much thought. The map is fundamentally an idea for an alternative way of exploring and understanding a suburban area from a new perspective. It also exposes how our surroundings are potentially filled with interesting places that we may usually take for granted. #01 A Stranger in a Strange Land, demonstrates the growing interest in exploring our urban surroundings on foot. The text underlines how our cities are primarily “car-scapes“. Vehicular transportation dictates our perception of our surroundings and subdues our relationship with it. However, by re-engaging with our surroundings on foot we can understand them in a more tactile, physical and profound way. 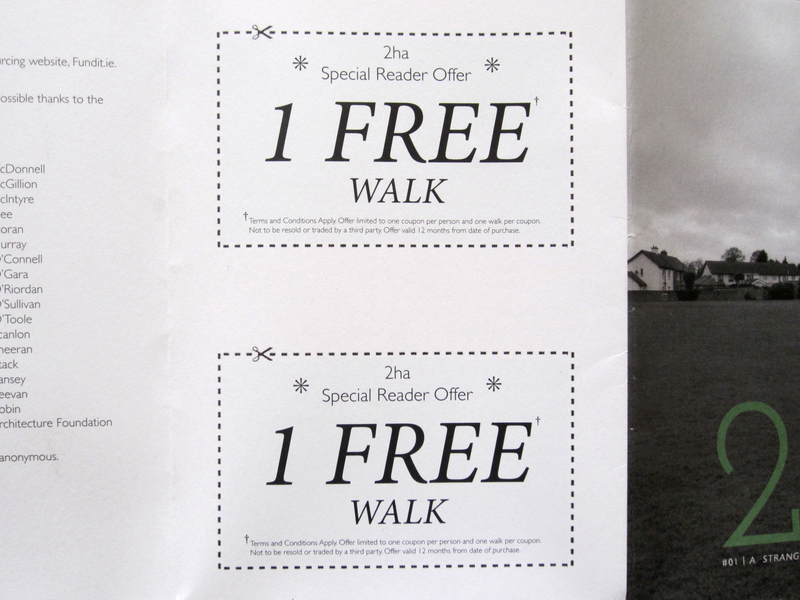 A nice detail featured on the reverse of the map is the inclusion of two coupons entitling readers to 1 FREE WALK. However, readers must bear in mind that conditions apply and that the coupons are only valid for 12 months after the time of purchase. To take advantage of this unique opportunity we should get walking without haste. To purchase this or any forthcoming editions, you can visit the 2ha website here. This week I completed the 30th and final walk for my Perambulation series. Now, I have the task of trying to shape the work into an interesting series of photographs ready to be made into a book. 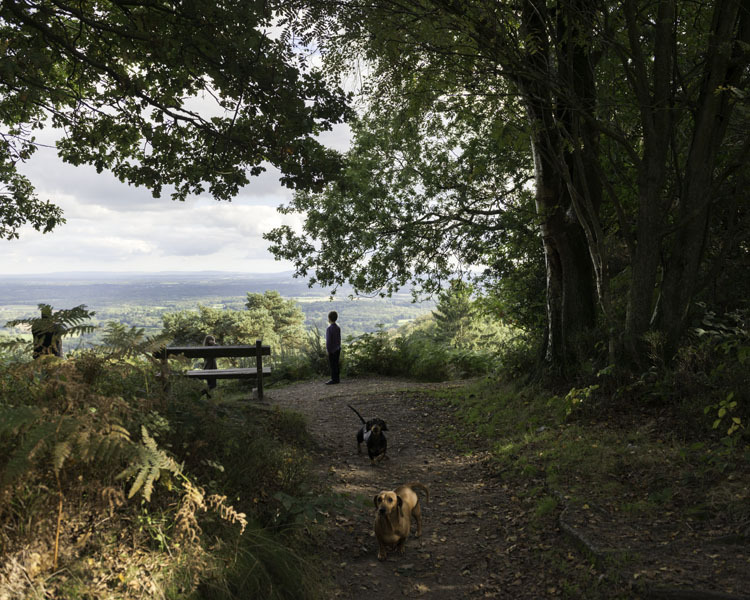 This photograph was taken during my final walk at Black Down, the highest hill in Sussex. As I arrived at the lookout, I was embarrassingly chased back down the path by two ravenous sausage dogs (what a total wimp, I admit it). The view looks out over the rolling hills of the Downs, a fitting place to say a temporary farewell to the Sussex landscape. Richard Long, “One Step Beyond”, the Observer, May 10, 2009.